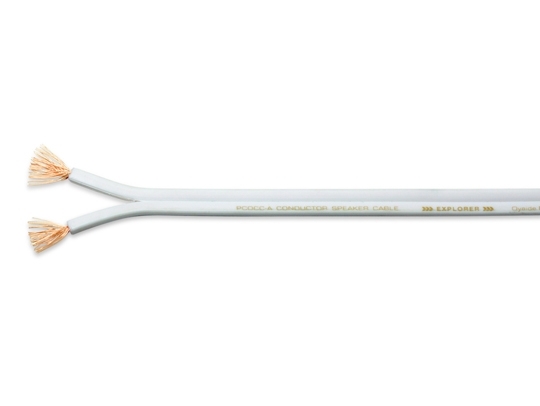 The EXPLORER is a new speaker cable which is simply composed of the conductor and the insulator. Its stranded conductors are parallel layout design and have multi-layered structure. Rather than twisting whole wires, the triple-layered inverted concentric structure is employed for maximum density and uniformity, for infilling of internal space and for preventing deformation among the wires. The insulator is made of newly-applied FLEX PE (Polyethylene) which has both electric characteristic and flexibility. Furthermore, the EXPLORER was designed in geometric shape in order to contact to the floor on line although it appears to be a rectangular shape seemingly. In addition, it has an air hole between conductors for vibration damping and prevention of electric permittivity rise. The EXPLORER adds a whole new value and expands the enjoyment of your "audio life". FLEX PE (polyethylene) which has both electric characteristic and flexibility is newly applied for the EXPLORER. FLEX PE is produced by adding substances to polyethylene in order to get flexibility without impairing electric property. And we also paid careful attention to strengthen the cohesiveness of its insulator and conductor in order to infill random space for lossless signal transmission. The core of the EXPLORER is parallel-arranged PCOCC-A signal transmission unit. Rather than twisting whole wires, 7wires of PCOCC-A are grouped in a unit and then 7units are grouped in a structure. This helps to get rid of random spaces between wires for maximum density and uniformity. The EXPLORER was designed in geometric shape in order to contact to the floor on line although it appears to be a rectangular shape seemingly. In addition, it has an air hole between conductors for vibration damping and prevention of electric permittivity rise.